Studs, Geldings, and Mares, OH MY! Keeping studs, geldings, and mares on the same farm presents a unique challenge, but it can be done safely with careful thought and planning. Breeding season stirs things up with this unique mix of horses, but Buckley Fence, LLC has some strategies to keep the peace on your farm when studs, geldings, and mares are all present. The key to a peaceful co-existence between studs, geldings, and mares, is separation. 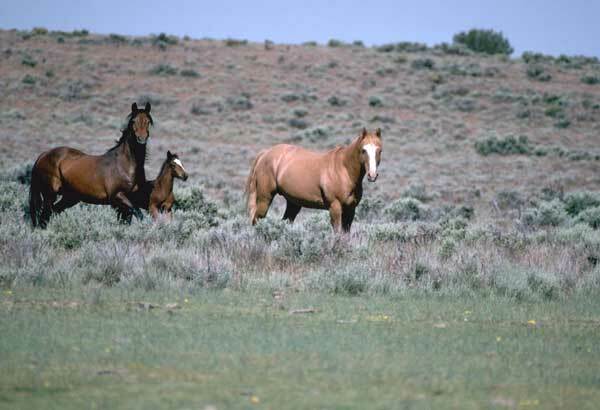 Many geldings and mares can get along peacefully, but the presence of stallions complicates the issue. On a facility with all three types present, it's best to separate horses by type. Many pastures with sufficient space between them will be key to a well-organized facility. You'll quickly learn which horses can share fence lines, but to start, try to arrange the property so that only mares share fence lines with each other, and the geldings are turned out in a separate area of the farm. Stallions should be turned out a great distance away from the mares; being within sight of the mares can get stallions quickly worked up during breeding season or when the mares are in heat. The more you can distance studs from mares, the better – if possible, use the barn itself as a separation and stall the studs on the opposite side of the barn from the mares. Additionally, keep stallions in either a separate barn or a separate area of the barn from the mares. It's unwise to ever cut corners on fencing or stall materials with horses, but it's even more important to invest in quality materials when you have studs present on your property. Some states have regulations on the minimum height a fence must be when used to enclose a stud; familiarize yourself with your state and town's regulations for horsekeeping before you build or renovate your facilities. When creating facilities to hold a stallion, height is important. Stalls will need to be at least eight feet high to discourage climbing, and the aisles in your barn should be at least ten feet wide to give separation and spacing. Build fences high and strong, especially those that will be used to house stallions. Pairing solid fencing with electric can discourage stallions from challenging the fencing, but be sure that, like Buckley Fence, LLC's steel board fence, any product you use does give away during a serious impact to keep the horse safe. Distance provides safety; plan your facility's layout carefully for the safety of both horses and handlers. Make the lanes between paddocks large and wide; if you're thinking of adding enclosed stalls, you might want to install the Classic Equine Equipment's Legend Stall Series. Additional safety can be achieved by double lines of fencing so that, in the event a horse should break loose, there is still a fencing line to separate it from the others. If you are challenged with a particularly dominant or uncontrollable stud, it may be safer to move him to a facility specifically equipped to deal with stallions and their special needs. Otherwise, with special care and attention, stallions, geldings, and mares can peacefully exist on the same farm. This entry was posted in Horse Fencing. Bookmark the permalink.